A practical solution! The construction provides variable options: it can be lifted and lowered, rotated and turned. 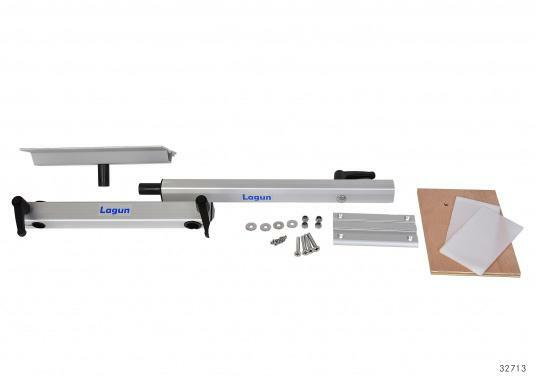 The table is space-saving and easy to assemble. Several table tops are available. €189.95 Incl. tax, excl. shipping. This table frame is flexible; suits most boats and allows you to move around in the cockpit without having the table in the way. It is fully articulating! Turn, rotate, lower or lift this table to suit all situations. The space under the table is not for its legs, but your! 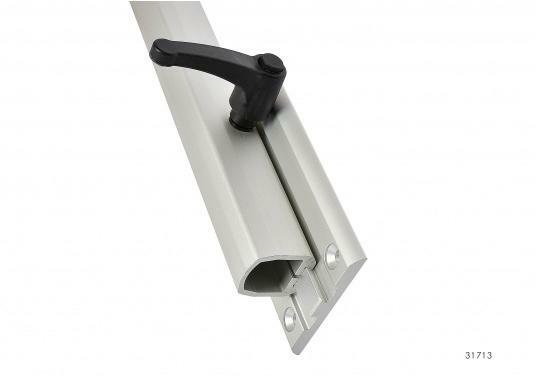 This frame can be locked in position with adjustable levers located on both the vertical and horizontal arms. Built to resist the harsh elements of the sea, it is manufactured from saltwater-resistant anodized aluminum and all moving parts are extremely hard wearing. 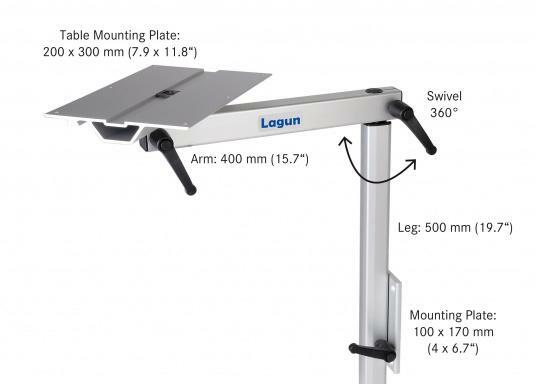 The Lagun table frame is easy to install and it takes only 30 seconds to mount or dismount. It stores flat when not in use. 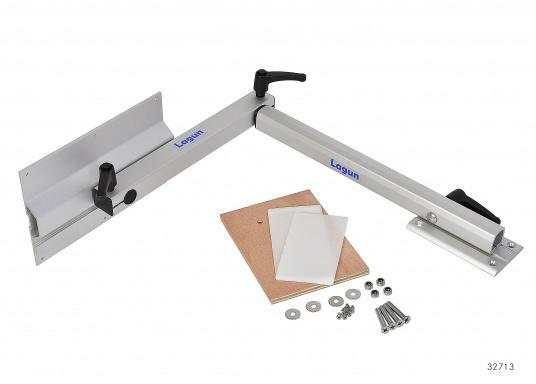 If you want to move that table to another location, for example the cabin, just buy an extra mounting plate. It`s that simple! Meine selbst gebaute Tischplatte ist nicht gerade leicht. Deshalb war ich am Anfang skeptisch, was die Tragkraft des LAGUN Untergestelles anbelangt. Doch das Gestell trägt meine Tischplatte mit Leichtigkeit. Danke für diese Top Qualität. Très bon produit, fabrication sérieuse, à recommander. Die Grundplatte hätte rundum um 45 Grad abgeschrägt sein können-nachträglich wg.